My little grand niece, Zoey Iverson is quite a character. Always on the go, she makes sure that there is never a dull moment in her family’s home. 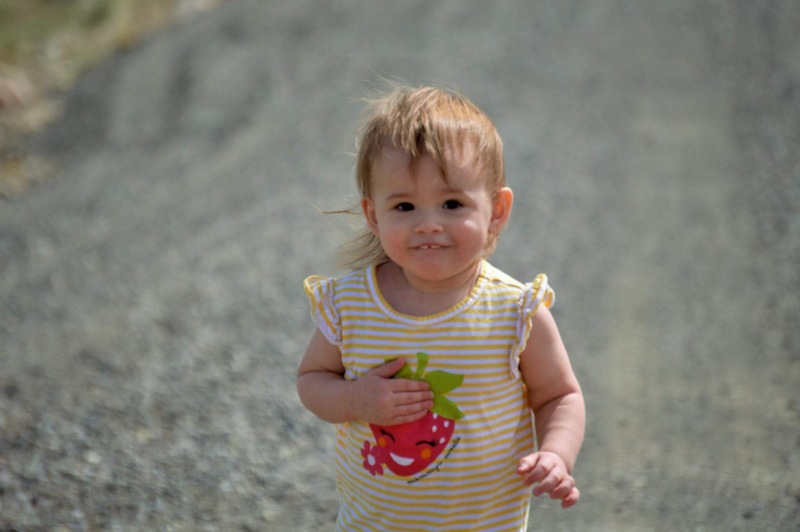 You see, Zoey is turning two today, and she is into exploring…everywhere!! 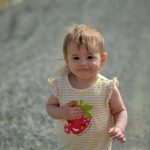 As any parent of a two year old…past or present…can tell you, a two year old exploring means that nothing is safe, and the parents must always be on guard duty. Zoey’s mom, Cassie tells me that Zoey has made the whole house into a jungle gym. Now that reminds me of my own daughter, Amy who somersaulted down the hallway, and swung from the table. I never knew what she would do next, and that meant I had to make sure everything was pretty well anchored to the floor…or at least not top heavy, because it might become a swing for a little girl. All I can say is…I’ll be praying over your sanity, Chris and Cassie. Miss Zoey is not just a two year old gymnast, she is also a princess…complete with her princess dresses. She loves to play dress up, and get her bling on, and who can blame her. I think most girls love to get their bling on. Zoey is quite sure that she is the queen of her castle. She is currently working on teaching herself to play the piano. When asked how that is going, her mom tells me that she is “banging on the piano,” so it looks like she might need just a little bit more practice…or perhaps lessons someday. If she likes the piano, she might have a long standing career or at least a hobby for the rest of her life. Kids often develop their likes and dislikes early in life. Zoey is learning to put her own shoes on too. She loves to get them on the right feet the first time. I’m sure it makes her feel like a grown up. Chris and Cassie love to take their kids out for walks, and Zoey is not into sitting in a stroller. She wants to walk!! 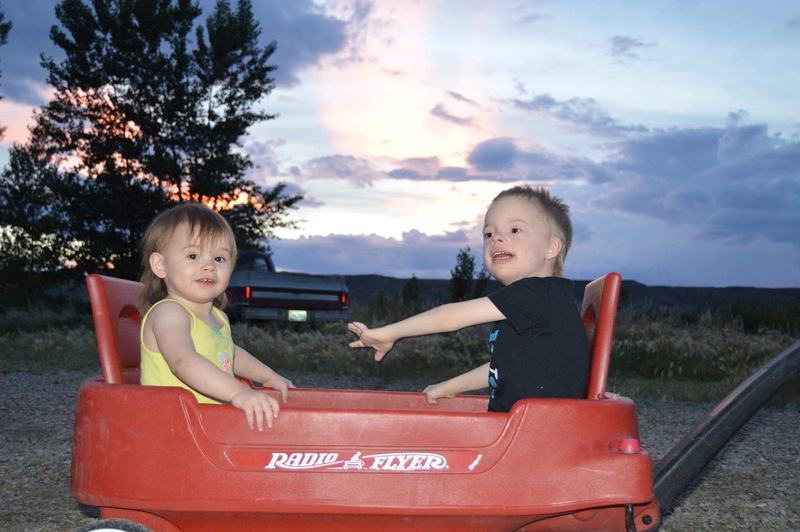 Of course, sitting in a wagon with her brother Lucas is ok sometimes too, because Zoey loves her big brother. Today is Zoey’s 2nd birthday. Happy birthday Zoey!! Have a great day!! We love you!! My co-worker is a high school student named, Amanda Ingram. 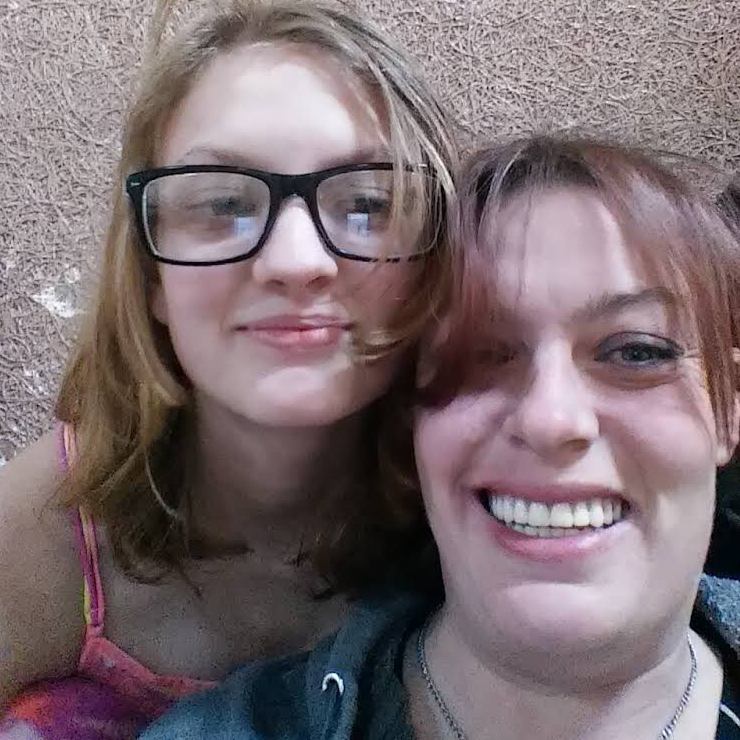 Amanda is also taking a college class through the Boces program this summer. She is taking Wyoming History, and she was required to write a paper concerning the boom and bust cycle in Wyoming, using newspapers from the 19th, 20th and 21st centuries. She was given a public website to use to locate news articles for her paper. That intrigued me, and I decided to check out the site. The site allows you to look by city, county, year, or simply by all newspapers. When I went in to look, I of course, went for the oldest newspaper they had. What I found was so exciting. That first newspaper in Wyoming was The Chugg Water Journal, out of Fort Laramie, published on October 2, 1949. For those who live in Wyoming, spelling Chugwater…Chugg Water is very strange. 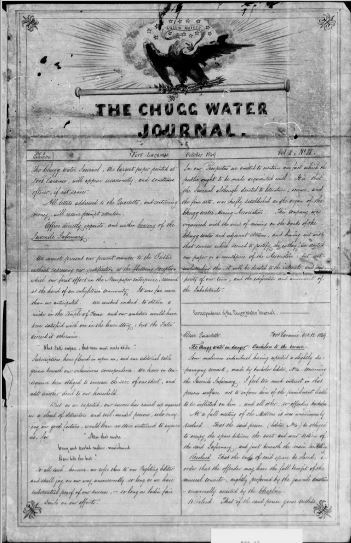 That made me think, mostly about what Chugwater meant anyway, and why it might be written Chugg Water for the newspaper. The word “chug” is said to describe the noise that the buffalo or the falling chalk made when it hit the ground or fell into the water under the bluff, depending on which version of the legend you wish to believe. Because of that, the Indians began to call the area “water at the place where the buffalo chug.” The White Man adopted the Indian name and called the area “Chug Springs.” Chugwater Creek was named after Chug Springs, and from that came the name of Chugwater. Still, the reason for the name of the paper is speculation on my part. 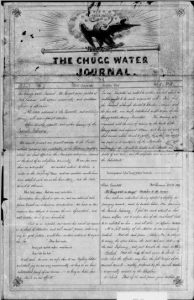 I am assuming that it was in an effort to remain more or less purist about the name, and since Chug Springs came first, that might be reason the paper was named the Chugg Water Journal. Aside from the name of the paper, I was very interested in the fact that it was hand written…at least at first. Of course, I knew that many newspapers were hand written at first, because there was no such thing as a printing press, or even typewriters for a long time, but to be able to actually view a handwritten newspaper was very exciting to me. My inquisitive mind embarked on a different thought journey. If the newspaper were hand written, and the town had 50 families in it, all of whom wanted a paper, how long would it take to write all those papers up? And was it the same person doing it? Wow!! After a time, you would know the news by heart, and it would become seriously old news. Then, when you consider the fact that the paper was to “appear occasionally and sometimes oftener, if not sooner”…whatever that actually meant, the news became really old. Still, the paper and its possible contents intrigued me. 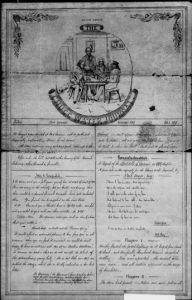 I started thinking about different dates and events in Wyoming’s history that might have appeared in that and other Wyoming newspapers. Would a first-hand account be more accurate that the history books? Even if history’s account is accurate, the newspapers would provide the feelings of the writer, and that is pure gold, because that makes it personal. I found myself feeling very excited about my future visits to this and other old and handwritten newspaper sites. I know that I will find many treasures. 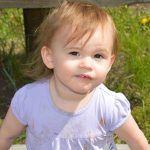 My grand niece, Raelynn Masterson is a sweet girl who looks a lot like her mom, my niece, Dustie Masterson. They are really very much alike in lots of ways. They both love music, and Dustie tells me that it isn’t just one kind of music that Raelynn likes…it’s all kinds of music. I think it is a sign of a true music lover, to love all genres of music, because it doesn’t seem to be the music style that attracts them, but rather each tone on its own and the melody it produces when mixed with other tones. There is a big part of Raelynn that reminds me of me too. Where do I begin? Raelynn loves to write stories…sound familiar to anyone? This seems to be a pastime that Raelynn and her peers are all into these days. She love reading their stories, and they love reading hers. Her stories are further enhanced with her own anime drawings to help tell the story. Now this is where we very much differ, because I cannot draw, so my stories are accompanied by photos. Her mom says that while she doesn’t pretend to understand Raelynn’s love of anime, she can easily see the beauty of her drawings, and the beauty in the stories that accompany the drawings. Another way in which Raelynn reminds me of me is that she loves police procedural shows like Bones and Criminal Minds. I love those shows too, as well as NCIS and CSI, which I’m sure she likes as well. I think it might be the scientist that lives in both of us. We may not be trained scientists, but we really appreciate the scientific procedures and their outcomes. 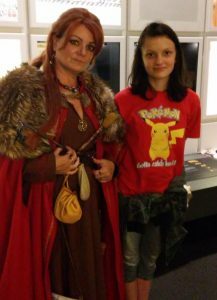 We are both utter geeks. Raelynn learned a Viking game that is a cross between Chess and Tic-Tac-Toe. She recently learned to play at the Science Museum in Denver and the lady that taught her said she did very well…more of the geek I think. I think most women, especially have the ability to multi-task, but some do it much better that others. When Dustie told me (and I’ve seen it for myself when I’ve been at her house) that Raelynn is an exceptional multi-tasker, it was like someone took a picture of me in the evenings when I’m not on a walk. Raelynn loves to do all these things…reading, writing, drawing, police procedural shows…and she does them at the same time…and doesn’t miss a beat on any one of them. That is the mark of a true multi-tasker, and I find that exceptional!! Raelynn and I both love cats…seriously, is this girl related to me or what? 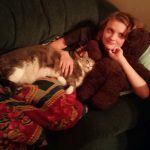 If you need to find the family cat, Lewie inside the house, just find Raelynn, because she is Lewie’s human…and that’s all there is too it. Lewie doesn’t really like the family dog, Missy, and so his favorite place to be in the whole world is with his human. He loves to lay beside her, and she in kind pets him and makes him feel safe and loved. 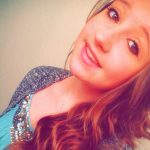 Recently, Raelynn proved what a strong person she is, when she went through a life changing surgery for scoliosis. Raelynn’s life thus far has been spent with limited mobility and much pain, and yet, she never complained. She had to tell her friends sometimes, that she couldn’t do certain things, because if she bent over, as if to touch her toes, you could see that her spine was near her shoulder blade, and it caused her great pain. Nevertheless, she wasn’t a whiner…or a quitter. She pursued her dreams with a gusto, often ignoring the pain to do the things she wanted to do. She wore a back brace for years and while it really limited movement, she didn’t complain. Now, post surgery, she is healing quickly and is off of all prescription pain meds. She is a shining example of what God can do, if you allow Him to. She is a God-given blessing to her parents, and indeed her whole family. Today, Raelynn turns 14 years old. She is growing into a beautiful young woman. Happy birthday Raelynn!! Have a great day!! We love you!! When people first began immigrating to the English Colonies, travel was not easy. In fact, sometimes it was absolutely treacherous. The only way to reach the new world was to travel by ship, and since storms were not able to be predicted far in advance, like they are these days, they sometimes found themselves at the mercy of the raging storm they were caught in. The first person known to have reached Bermuda was the Spanish sea captain Juan de Bermúdez in 1503. The islands are named after him. He claimed the islands for the Spanish Empire. De Bermúdez never landed on the islands, but made two visits to the island chain, and over the course of those visits, he created a recognizable map. I’m sure that at some point, de Bermúdez assumed that there would be people living on the islands, but it was not expected to be quite as soon as it was, or in quite the way that it was populated. 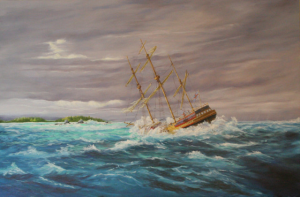 On July 28, 1609, a ship named Sea Ventureran into a reef that surrounds Bermuda during a hurricane. The ship was on its way to Jamestown, Virginia, but would not make it to that destination. The Sea Venture set out for Virginia on June 2, 1609, under the command of Sir George Somers, admiral of the fleet, with Christopher Newport as captain and Sir Thomas Gates, Governor of the colony. Sea Venture sailed with a fleet of ships, including the Falcon, Diamond, Swallow, Unity, Blessing, Lion, and two smaller ships. The ships were only eight days from the coast of Virginia, when they were suddenly caught in a hurricane. 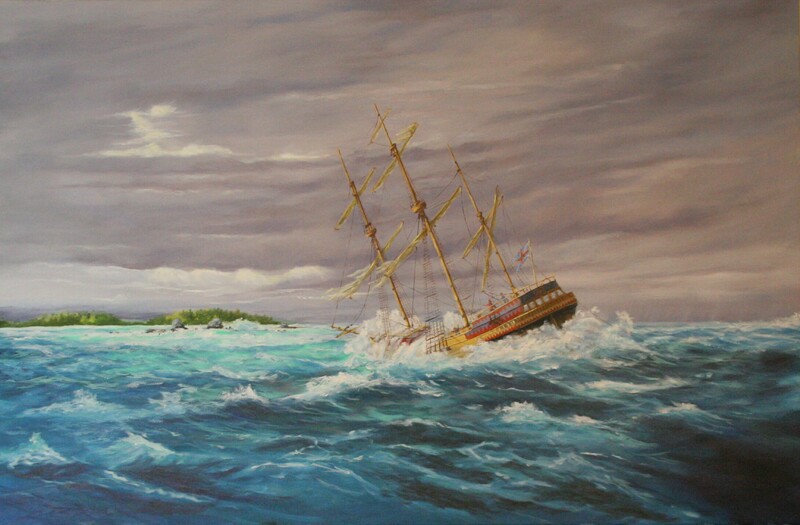 The Sea Venture became separated from the rest of the fleet, while its crew fought the storm for three days. Other ships the size of Sea Venture had successfully fought and survived such weather, but the Sea Venture had a one major problem. The Sea Venture was a new ship, and its timbers had not yet set. The storm forced the caulking from between the timbers, and the ship began to leak rapidly. The crew began desperately bailing, but water continued to pour into the hold. The crew threw some of the guns overboard in an effort to make the ship lighter, but this only delayed the inevitable. The island was owned as an extension of Virginia by the Virginia Company until 1614. Then the Somers Isles Company, took over in 1615 and managed the colony until 1684. At that time, the company’s charter was revoked, and England took over administration. Bermuda became a British colony following the 1707 unification of the parliaments of Scotland and England, which created the Kingdom of Great Britain. After 1949, when Newfoundland became part of Canada, Bermuda became the oldest remaining British overseas territory. After the return of Hong Kong to China in 1997, Bermuda became the most populated British territory. Today, Bermuda is a popular vacation spot for many tourists. Cruise ships and planes arrive daily. I’m sure the islands would have eventually been populated, but in the case of Bermuda, it was very much an accidental population, caused by an unfortunate ship wreck that first brought its survivors to the islands. Recently, I discovered that Amelia Earhart is my 8th cousin once removed on my dad, Allen Spencer’s side of my family. Prior to this time, I knew of Amelia and her accomplishments, as well as her disappearance, but other than the fact that the whole thing was sad, it really didn’t affect me very much. Maybe it’s the fact that I now know that she is a relative, or maybe it’s the fact that the whole plot of the mystery seems to have thickened with some new information. Either way, I find myself intrigued by this new information. These days, with so much fake news, and so much speculation about things, it’s hard to believe things sometimes. Still, so much of this evidence seems to point to facts very different from the theories we have believed to be truth for so long. We know that Earhart was last heard from on July 2, 1937, as she made her quest to become the first woman pilot to circumnavigate the globe. She was declared dead two years later after the United States concluded she had crashed somewhere in the Pacific Ocean, but her remains were never found. 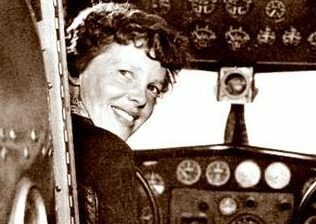 Now, these investigators believe they have found evidence that Earhart and Noonan were blown off course, but survived the ordeal. The investigative team behind the History channel special believes the photo may have been taken by some secret spy for the United States on Japanese military activity in the Pacific. It is not clear how Earhart and Noonan could have flown so far off course. Les Kinney, a retired government investigator has spent 15 years looking for Earhart clues, about what really happened to her. He said the photo “clearly indicates that Earhart was captured by the Japanese.” Japanese authorities told NBC News they have no record of Earhart being in their custody, but then it is doubtful that they would have been honest with us if they had her. 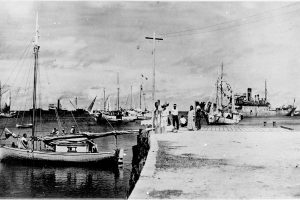 The photo, marked “Jaluit Atoll” and believed to have been taken in 1937, shows a short-haired woman, believed to be Earhart, sitting on a dock with her back to the camera. Like Earhart, the woman was wearing pants, something for which Earhart was known, even though it was odd in those days. Near her is a standing man who looks like Noonan, so much so that when a transparent photo of him fits it perfectly…down to the hairline. “The hairline is the most distinctive characteristic,” said Ken Gibson, a facial recognition expert who studied the image. “It’s a very sharp receding hairline. 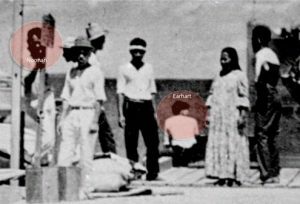 The nose is very prominent.” Gibson added, “It’s my feeling that this is very convincing evidence that this is probably Noonan.” The photo also shows a Japanese ship, Koshu, towing a barge with something that appears to be 38 feet long airplane…the same length as Earhart’s plane. 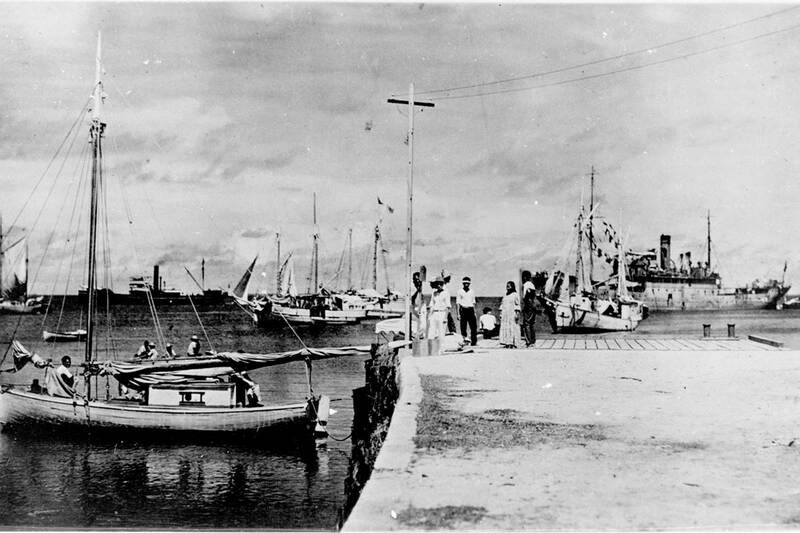 The locals have continued to claim that they saw Earhart’s plane crash before she and Noonan were taken away. Native school kids insisted they saw Earhart in captivity. The story was even documented in postage stamps issued in the 1980s. “We believe that the Koshu took her to Saipan, in the [Mariana Islands], and that she died there under the custody of the Japanese,” said Gary Tarpinian, the executive producer of the History special. 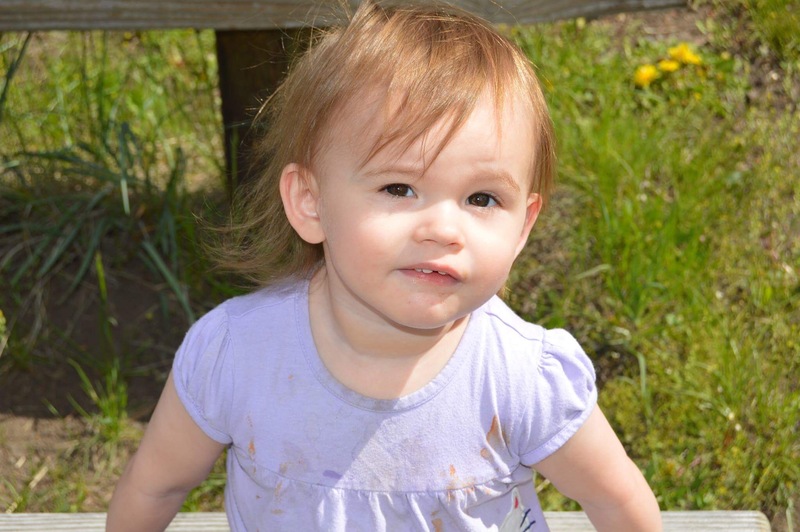 “We don’t know how she died,” Tarpinian said. “We don’t know when.” Josephine Blanco Akiyama, who lived on Saipan as a child, has long claimed she saw Earhart in Japanese custody. “I didn’t even know it was a woman, I thought it was a man,” said Akiyama. “Everybody was talking about her — they were talking about in Japanese. That’s why I know that she’s a woman. They were talking about a woman flyer.” It is not clear if the United States government knew who was in the photo, or if it was taken by a spy, the United States may not have wanted to compromise that person by revealing the image. If that were the case, sadly two lives were sacrificed for one. These days, since man has already been on the moon, I don’t suppose the scientists would feel the same excitement about seeing it through a telescope that they felt the first time they looked at it through a telescope. I’m sure that the creation of a map of the moon was an amazing accomplishment back in the 1600s. The earliest known telescope was built in 1608 in the Netherlands when an eyeglass maker named Hans Lippershey tried to obtain a patent on one. Although Lippershey did not receive his patent, news of the new invention soon spread across Europe. The design of these early refracting telescopes consisted of a convex objective lens and a concave eyepiece. The world was headed for a new and exciting journey that would someday put man in space and on the moon. 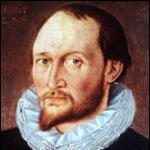 Thomas Harriot was a mathematician and astronomer who founded the English School of Algebra. He is described by some as “the greatest mathematician that Oxford has produced,” yet only recently has his name become widely known, and even now his achievements are not fully appreciated by most mathematicians. I’m sure he was an amazing mathematician, but it is his work in astronomy that interests me. As an undergraduate at Oxford, Harriot was a student at St Mary’s Hall. Harriot graduated in 1580 and went to London. We know from manuscripts, belonging to Harriot, that he was engaged in deep studies of optics at Syon by 1597. Although in his manuscripts it states that he had discovered the sine law of refraction of light before 1597. The precise date of Harriot’s important discovery was July 1601. As with all his other mathematical discoveries, however, Harriot did not publish his findings. It is somewhat ironic, that Snell…to whom the discovery of this law is now attributed…was not the first to publish the result. Snell’s discovery was in 1621, about 20 years after Harriot’s discovery, but the result was not published until Descartes put it in print in 1637. He considered more complex systems and employed Christopher Tooke as a lens grinder from early 1605. His work on light now moved to the dispersion of light into colors. He began to develop a theory for the rainbow By 1606, Johannes Kepler had heard of the remarkable results on optics achieved by Harriot. Kepler wrote to Harriot, but the correspondence never really achieved any significant exchange of ideas. Perhaps Harriot was too wary of the difficulties that his work had nearly brought on him, or perhaps he did, as he claimed to Kepler, still intend to publish his results. The appearance of a comet attracted Harriot’s attention and turned his scientific mind towards astronomy. He observed a comet on September 17, 1607 from Ilfracombe which would later be identified as Halley’s Comet. Kepler had discovered the comet six days earlier, but it would be the observations of Harriot and his friend…and student, William Lower which eventually were used by Friedrich Wilhelm Bessel to compute its orbit. His astronomy was now back in the forefront of his mind, and Harriot went on to make the earliest telescopic observations in England. On July 26, 1609 at 9pm, he sketched the Moon, after viewing it through a telescope with a magnification of 6. 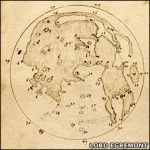 He sketched the Moon again a year later on July 17, 1610, by this time he had a telescope giving him a magnification of 10. Soon he had constructed a telescope with a magnification of 20, then by April 1611 he had a 32 magnification telescope. While mapping the moon might seem to some like a minor achievement, it inspired him to continuously improve the telescope. On a clear night, ocean travel is really safe, because ships can see each other easily. Fog, however, presents a much different situation. Nevertheless, radar should solve any problem that fog can cause…right? Theoretically, yes, it should, but on the night of July 25, 1856, something went horribly wrong with that whole system, and the authorities were very puzzled as to the cause. At 11:00pm on that Wednesday night, 45 miles south of Nantucket Island, Massachusetts…with a heavy Atlantic fog hanging in the air, two ships carrying 2,453 people were just ten minutes from disaster. In the mid-1950s, travel by steamer between Europe and America was commonplace. More than 50 passenger liners regularly made the transatlantic ocean voyage. The Andrea Doria was one of the most lavishly adorned steamers. Put to sea in 1953, it was the pride of the Italian line. It was built for luxury, not speed, and boasted extensive safety precautions, such as state-of-the-art radar systems and 11 watertight compartments in its hull. The Swedish ocean liner Stockholm, went into service in 1948. It was a more modest ocean liner, less than half the tonnage and carrying 747 passengers and crew on that fateful night. The Andrea Doria, by contrast carried 1,706 passengers and crew that night. 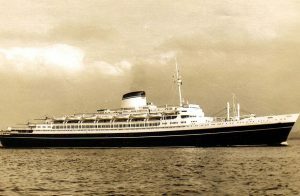 On the night of July 25, 1956, the Stockholm was beginning its journey home to Sweden from New York, while the Andrea Doria was steaming toward New York. The Andrea Doria had been in an intermittent fog since midafternoon, but Captain Piero Calami, relying on his ship’s radar to get him to his destination safely and on schedule, only slightly reduced his speed. At the same time, the Stockholm was directed north of its recommended route by Captain H. Gunnar Nordenson, who was trying to reduce his travel time. In so doing, he risked encountering westbound vessels. The Stockholm also had radar and expected no difficulty in navigating past approaching vessels. Captain Nordenson failed to anticipate that a ship like the Andrea Doria could be hidden until the last few minutes by a fogbank. At 10:45pm, the Stockholm showed up on the Andrea Doria’s radar screens, about 17 nautical miles away. Soon after, the Andrea Doria showed up on the Stockholm’s radar, about 12 miles away. What happened next has been disputed, but it’s likely that the crews of both ships misread their radar sets. Captain Calami made a dangerous decision to turn the Andrea Doria to port for an unconventional starboard-to-starboard passing, which he erroneously thought the Stockholm was attempting. About two miles away from each other, the ship’s lights came into view of each other. Third Officer Johan-Ernst Bogislaus Carstens, commanding the bridge of the Stockholm, then made a conventional turn to starboard. Less than a mile away, Captain Calami realized he was on a collision course with the Stockholm and turned hard to the left, hoping to race past the bow of the Stockholm. Both ships were too large and moving too fast to make a quick turn. At 11:10pm, the Stockholm‘s sharply angled bow, reinforced for breaking ice, smashed 30 feet into the starboard side of the Andrea Doria. For a moment, the smaller ship was lodged there like a cork in a bottle. Then, the opposite momentum of the two ships pulled them apart, and the Stockholm‘s smashed bow screeched down the side of the Doria, sending sparks into the air. Five crewmen of the Stockholm were killed in the collision. 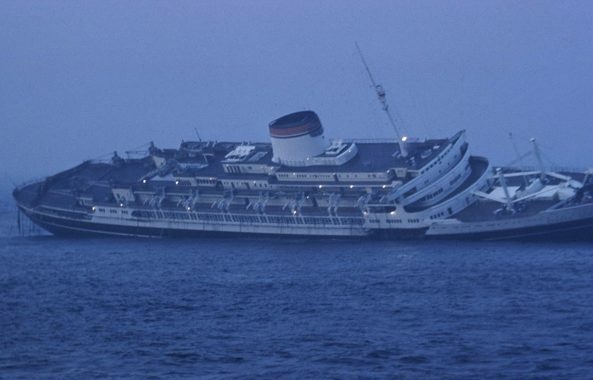 The Andrea Doria fared far worse. The bow of the Stockholm crashed through passenger cabins, and 46 passengers and crew were killed. One man watched as his wife was dragged away forever by the retreating bow of the Stockholm. 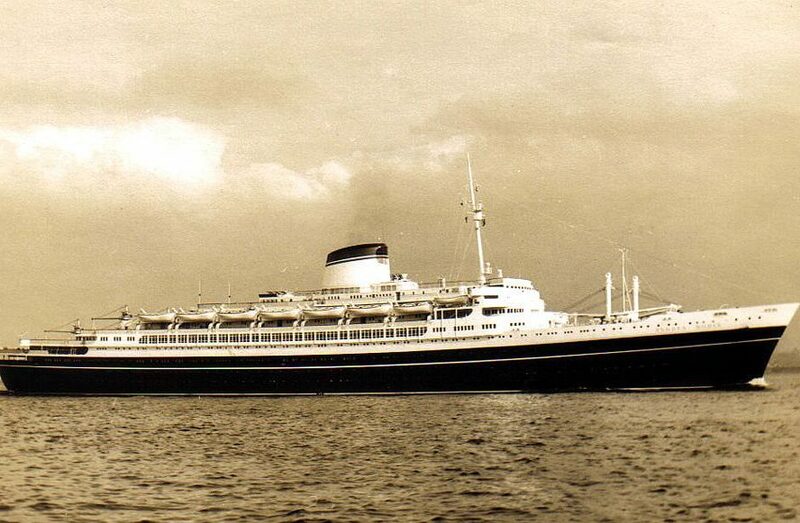 Fourteen year old Linda Morgan was asleep on the Andrea Doria when the impact somehow threw her out of bed and onto the Stockholm’s crushed bow. She was later dubbed “the miracle girl” by the press. With seven of its 10 decks ripped open and exposed to the Atlantic waters, the Andrea Doria listed more than 20 degrees to port in minutes, and its watertight compartments were compromised. A lifeboat evacuation began on the doomed ship, but went far from smoothly. The port side could not be used because the ship was listing too much, which left lifeboat seats for 1,044 of the 1,706 people on board. Passengers in the lower cabins fought their way through darkened hallways quickly filling with ocean water and leaking oil. The first lifeboat was finally deployed an hour after the collision, and held more crew than passengers. Because the Stockholm had suffered a nonfatal blow, it was able to lend its lifeboats to the evacuation effort. Several ships heard the Doria’s mayday and came to assist. At 2:00am on July 26, the Ile de France, another great ocean liner, arrived and took charge of the rescue effort. It was the greatest civilian maritime rescue in history, and 1,660 lives were saved. The Stockholm limped back to New York, damaged but afloat. At 10:09am on July 26, the Andrea Doria sank into the Atlantic. 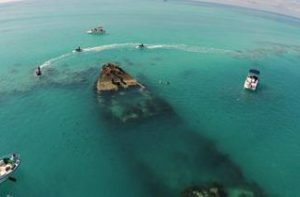 Almost immediately, the wreck, which is located at a depth of 240 feet of water, became a popular scuba diving destination. However, the Andrea Doria is known as the “Mount Everest” of diving locations, because of the extreme depth, the presence of sharks, and unpredictable currents. Shipwrecks on the Great Lakes are not a totally uncommon event. Over the last 300 years, Lake Michigan has claimed countless ships, mostly in violent storms and bad weather, especially when the gales of November come in. Nevertheless, a few ships went down without even reaching open waters. One of those ships was the SS Eastland, which went down while docked between LaSalle and Clark Streets on the Chicago River. That site and that ship became the site of the greatest loss of life on the Great Lakes, and it wasn’t a fire, explosion, or act of war, but rather something far more strange. 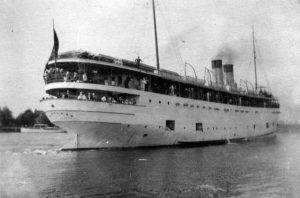 The SS Eastland was built by the Michigan Steamship Company in 1902 and began regular passenger service later that year. In July 1903, the ship held an open house so the public could have a look. 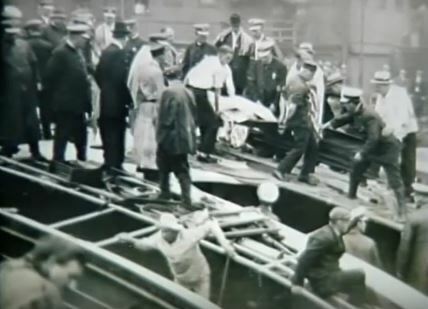 The sudden number of people, particularly on the upper decks, caused the Eastland to list so severely that water came in through the gangways where passengers and freight would be brought aboard. The ship was obviously top-heavy and this problem had to dealt with quickly, but these incidences continued to plague the ship. In 1905, the Eastland was sold to the Michigan Transportation Company. During the summer of 1906, the Eastland listed again as it transported 2500 passengers, and her carrying capacity was reduced to 2400. But in July 1912, the Eastland was reported as having once more listed to port and then to starboard while carrying passengers. In 1915, the LaFollette Seaman’s Act, which was created as a response to the Titanic not carrying sufficient lifeboats, was passed. The Seaman’s Act mandated that lifeboat space would no longer depend on gross tonnage, but rather on how many passengers were on board. However adding extra weight to the ship put top-heavy vessels like the Eastland at greater risk of listing. In fact, the Senate Commerce Committee was cautioned at the time that placing additional lifeboats and life rafts on the top decks of Great Lakes ships would make them dangerously unstable. This was a warning that the Senate Committee and the Eastland should have heeded. 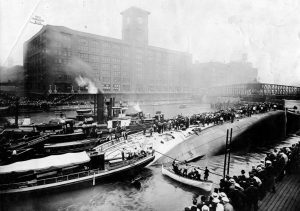 On July 24, 1915, the Eastland once again fell victim to its top heavy design, and this time the outcome was disastrous. On that cool Saturday morning in Chicago, the Eastland and two other steamers were waiting to take on passengers bound for an annual company picnic in Michigan City, Indiana. For many of the employees of Western Electric Company’s Hawthorne Works, this would be the only holiday they would enjoy all year. A large number of these employees from the 200-acre plant in Cicero, Illinois were Czech Bohemian immigrants. Excitement was in the air as thousands of employees thronged along the river. Three ships would transport them across Lake Michigan to the picnic grounds in Indiana. The Eastland was slated to be the first ship boarded. That morning the Eastland was docked between LaSalle and Clark Streets on the Chicago River. 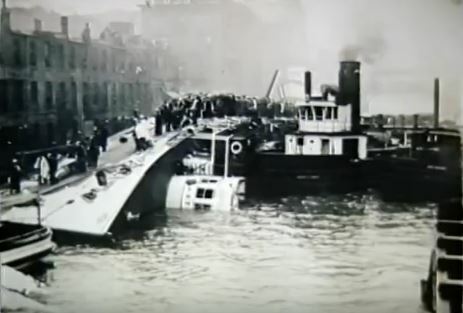 As soon as passengers began boarding, Captain Harry Pedersen and his crew noticed that the ship was listing to port even though most passengers were gathered along the starboard. Attempts were made to right the vessel, but stability seemed uncertain. At 7:10am, the ship reached its maximum carrying capacity of 2572 passengers and the gangplank was pulled in. As the captain made preparations to depart at 7:21am, the crew continued to let water into the ship’s ballast tanks in an attempt to stabilize the vessel. At 7:23am, water began to pour in through the port gangways. Within minutes, the ship was seriously listing but most passengers seemed unaware of the danger. I wondered how this could have continued to happen, until I saw this video, that explained it very well. By 7:27am, the ship listed so badly that passengers found it too difficult to dance so the orchestra musicians started to play ragtime instead to keep everyone entertained. Just one minute later, at 7:28am, panic set in. Dishes crashed off shelves, a sliding piano almost crushed two passengers, and the band stopped playing as water poured through portholes and gangways. In the next two minutes, the ship completely rolled over on its side, and settled on the shallow river bottom 20 feet below. Passengers below deck now found themselves trapped as water gushed in and heavy furniture careened wildly. Men, women and children threw themselves into the river, but others were trapped between decks, or were crushed by the ship’s furniture and equipment. The lifeboats and life jackets were of no use since the ship had capsized too quickly to access them. In the end, 844 people lost their lives, including 22 entire families. It was a tragedy of epic proportions. Bystanders on the pier rushed to help those who had been thrown into the river, while a tugboat rescued passengers clinging to the overturned hull of the ship. An eyewitness to the disaster wrote: “I shall never be able to forget what I saw. People were struggling in the water, clustered so thickly that they literally covered the surface of the river. A few were swimming; the rest were floundering about, some clinging to a life raft that had floated free, others clutching at anything that they could reach…at bits of wood, at each other, grabbing each other, pulling each other down, and screaming! The screaming was the most horrible of them all.” Yes, I’m sure that was the worst, and the loss of life was something that would never be forgotten…especially for an eye witness. After the Soviet Union launched Sputnik, the world’s first satellite, on October 4, 1957, inspiring the United States to keep up, or fall behind in the Cold War, the United States launched it’s first satellite on January 31, 1958. That satellite was called Explorer 1, and followed the first two Soviet satellites the previous year…Sputnik 1 and 2. It was the beginning the Cold War Space Race between the two nations. Explorer 1 had mercury batteries that powered the high-power transmitter for 31 days and the low-power transmitter for 105 days. Explorer 1 stopped transmission of data on May 23, 1958 when its batteries died, but remained in orbit for more than 12 years. It reentered the atmosphere over the Pacific Ocean on March 31, 1970 after more than 58,000 orbits. The Explorer 1 payload consisted of the Iowa Cosmic Ray Instrument. It was without a tape data recorder, which was not modified in time to make it onto the spacecraft. The real-time data received on the ground was therefore very sparse and puzzling showing normal counting rates and no counts at all. I’m not sure what the counting was all about, so I guess I’m more confused than the scientists were. The later Explorer 3 mission, which included a tape data recorder in the payload, provided the additional data for confirmation of the earlier Explorer 1 data. Landsat 1, which was originally named “Earth Resources Technology Satellite 1”, was the first satellite in the United States’ Landsat program. It was the first satellite that was launched with the sole purpose of studying and monitoring the planet. 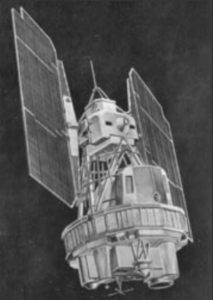 Landsat 1 was a modified version of the Nimbus 4 meteorological satellite and was launched on July 23, 1972 by a Delta 900 rocket from Vandenberg Air Force Base in California. Its orbit was near-polar and it served as a stabilized, Earth-oriented platform for obtaining information on agricultural and forestry resources, geology and mineral resources, hydrology and water resources, geography, cartography, environmental pollution, oceanography and marine resources, and meteorological phenomena. The spacecraft was placed in a sun-synchronous orbit, with an altitude between 564 and 569 miles. The spacecraft was placed in an orbit with an inclination of 99 degrees which orbited the Earth every 103 minutes. The project was renamed to Landsat in 1975. Landsat 1 had two sensors to achieve its primary objectives…the return beam Vidicon (RBV) and the multispectral scanner (MSS). The RBV was manufactured by the Radio Corporation of America (RCA). The RBV obtained visible light and near infrared photographic images of Earth. It was considered the primary sensor. The MSS sensor manufactured by Hughes Aircraft Company was considered an experimental and secondary sensor, until scientists reviewed the data that was beamed back to Earth. After the data was reviewed, the MSS was considered the primary sensor. The MSS was a four-channel scanner that obtained radiometric images of Earth. From launch until 1974, Landsat 1 transmitted over 100,000 images, which covered more than 75% of the Earth’s surface. The RBV only took 1690 images. In 1976, Landsat 1 discovered a tiny uninhabited island 12 miles off the eastern coast of Canada. This island was named Landsat Island after the satellite. The MSS provided more than 300,000 images over the lifespan of the satellite. 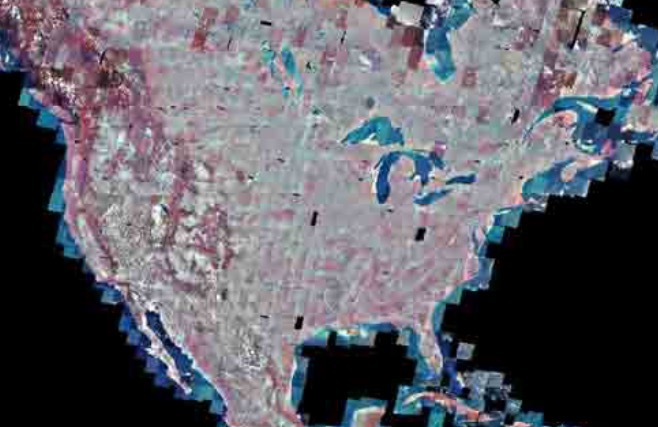 NASA oversaw 300 researchers that evaluated the data that Landsat 1 transmitted back to Earth. The Landsat 1 satellite sent data back to earth from its orbit until January of 1978 when its tape recorders malfunctioned. After that, it was taken out of service. Most people would agree that the prospect of taking a nation into war is a scary one at best…especially for its citizens. In 1916, the world was in the middle of World War I. Isolationism had been the order of the day, as the United States tried to stay out of this war, but by the summer of 1916, with the Great War raging in Europe, and with the United States and other neutral ships threatened by German submarine aggression, it had become clear to many in the United States that their country could no longer stand on the sidelines. With that in mind, some of the leading business figures in San Francisco planned a parade in honor of American military preparedness. 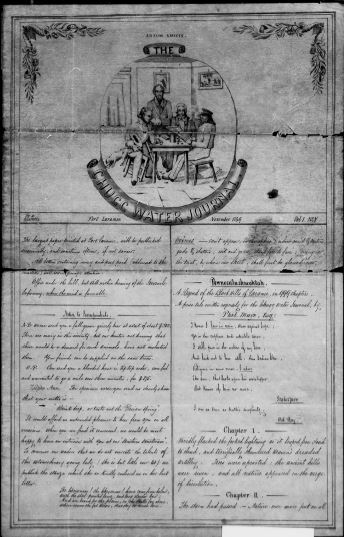 The day was dubbed Preparedness Day, and with the isolationist, anti-war, and anti-preparedness feeling that still ran high among a significant population of the city…and the country, not only among such radical organizations as International Workers of the World (the so-called “Wobblies”) but among mainstream labor leaders. These opponents of the Preparedness Day event undoubtedly shared the view voiced publicly by one critic, former U.S. Secretary of State William Jennings Bryan, who claimed that the organizers, San Francisco’s financiers and factory owners, were acting in pure self-interest, as they clearly stood to benefit from an increased production of munitions. At the same time, with the rise of Bolshevism and labor unrest, San Francisco’s business community was justifiably nervous. 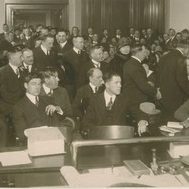 The Chamber of Commerce organized a Law and Order Committee, despite the diminishing influence and political clout of local labor organizations. Radical labor was a small but vociferous minority which few took seriously. Nevertheless, it became obvious that violence was imminent. A radical pamphlet of mid-July read in part, “We are going to use a little direct action on the 22nd to show that militarism can’t be forced on us and our children without a violent protest.” It was in this environment that the Preparedness Parade found itself on July 22, 1916. In spite of that, the 3½ hour long procession of some 51,329 marchers, including 52 bands and 2,134 organizations, comprising military, civic, judicial, state and municipal divisions as well as newspaper, telephone, telegraph and streetcar unions, went ahead as planned. 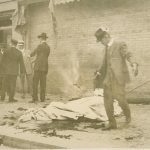 At 2:06pm, about a half hour after the parade began, a bomb concealed in a suitcase exploded on the west side of Steuart Street, just south of Market Street, near the Ferry Building. Ten bystanders were killed by the explosion, and 40 more were wounded, in what became the worst terrorist act in San Francisco history. The city and the nation were outraged, and they declared that justice would be served. Two radical labor leaders, Thomas Mooney and Warren K Billings, were quickly arrested and tried for the attack. In the trial that followed, the two men were convicted, despite widespread belief that they had been framed by the prosecution. Mooney was sentenced to death and Billings to life in prison. After evidence surfaced as to the corrupt nature of the prosecution, President Woodrow Wilson called on California Governor William Stephens to look further into the case. Two weeks before Mooney’s scheduled execution, Stephens commuted his sentence to life imprisonment, the same punishment Billings had received. Investigation into the case continued over the next two decades. By 1939, evidence of perjury and false testimony at the trial had so mounted that Governor Culbert Olson pardoned both men, and the true identity of the Preparedness Day bomber, or bombers, remains forever unknown.